Ideal for full sun protection while gardening or working outdoors. Shades your face and head. 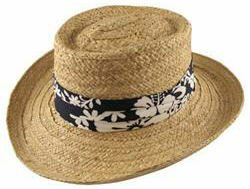 Natural material with fabric hat band. One size fits most. This hat helps keep the sun off my face and is nice enough that I don't have to be embarrassed about wearing it when neighbors stop by to chat while I'm out doing yardwork.